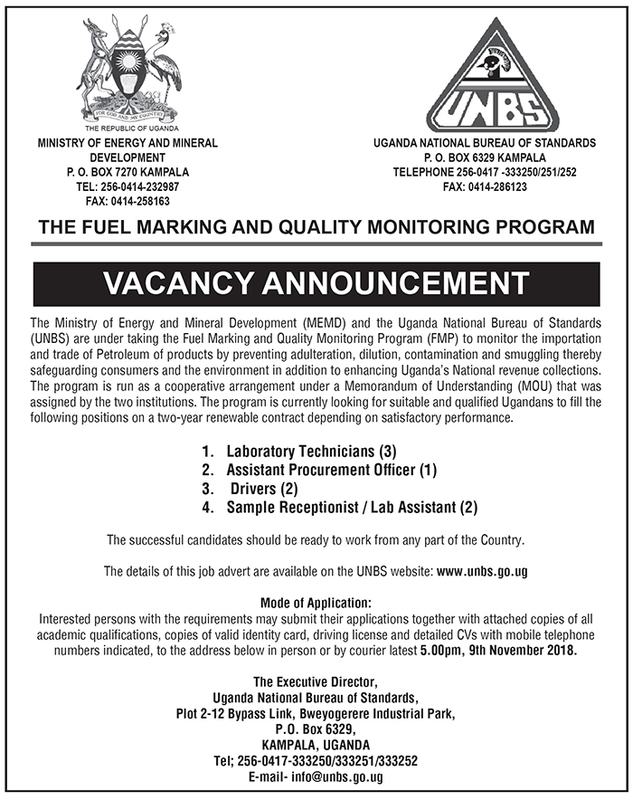 he Ministry of Energy and Mineral Development (MEMD) and the Uganda National Bureau of Standards (UNBS) are under taking the Fuel Marking and Quality Monitoring Program (FMP) to monitor the importation and trade of Petroleum of products by preventing adulteration, dilution, contamination and smuggling thereby safeguarding consumers and the environment in addition to enhancing Uganda’s National revenue collections. The program is run as a cooperative arrangement under a Memorandum of Understanding (MOU) that was assigned by the two institutions. The program is currently looking for suitable and qualiﬁed Ugandans to ﬁll the following positions on a two-year renewable contract depending on satisfactory performance. Interested persons with the requirements may submit their applications together with attached copies of all academic qualiﬁ cations, copies of valid identity card, driving license and detailed CVs with mobile telephone numbers indicated, to the address below in person or by courier latest 5.00pm, 9th November 2018.